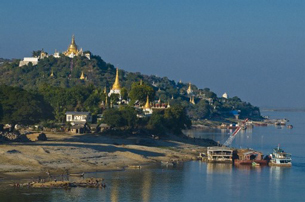 Sagaing is the capital of Sagaing Region (formerly Sagaing Division) in Myanmar. Located on the Ayeyarwady River, 20 km to the southwest of Mandalay on the opposite bank of the river, Sagaing with numerous Buddhist monasteries is an important religious and monastic center. The pagodas and monasteries crowd the numerous hills along the ridge running parallel to the river. The central pagoda, Soon U Ponya Shin Pagoda, is connected by a set of covered staircases that run up the 240 m hill. It is the administration seat of Pakokku Township and Pakokku District.